From @BalancingMama: Good, green, Grinchy fun! I am a theater lover. I did some acting as a kid and teen, and participated behind the scenes for a couple productions in college. I have not been on the stage in quite some time, but I still enjoy a good show now and then. Last night was no exception. 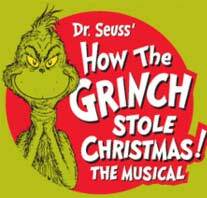 How The Grinch Stole Christmas (a musical!) arrived in Atlanta at the Fabulous Fox Theater. I left my husband at home to take care of little one's bedtime, grabbed a friend, left my cozy suburban home, and drove into town. The show was phenomenal! It follows the beloved Dr. Seuss tale we all know so well, but with a couple little tweaks to keep the audience riveted. The humor was relentless; I had tears in my eyes and a stitch in my side from laughing all the way through. Stefan Karl, well-known for his role as Robbie Rotten on LazyTown, played the Grinch role with absolute hairy, grumpy, grinchy perfection. 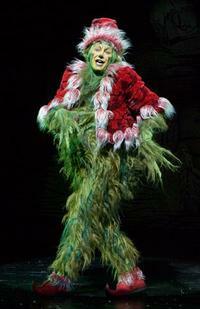 Now including How The Grinch Stole Christmas, I have seen 14+ Broadway-originated shows. This is definitely one of the most entertaining of the bunch. Loved, loved, LOVED it. Seriously! This show is only in Atlanta through December 4th - that means you need to hurry! Click on over to buy your tickets now. You will be glad you did. I received press passes for myself and my friend to the opening night production. All opinions are 100% mine. Empty toilet paper rolls? Art time!